Share data with other blocks in your Simulink model through input and output port connections. Import initial data values from the MATLAB® base workspace. Specify data scope, type, and other properties through the Property Inspector or the Model Explorer. Define data to share with Simulink models and the MATLAB base workspace. Define the data that a chart stores internally in its own workspace. Specify data properties by using the Property Inspector or the Model Explorer. Specify data by its location in the chart hierarchy. Configure your chart data to inherit properties from Simulink signals. 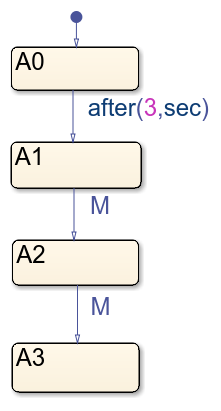 Compare the behavior of messages, events, and data in Stateflow® charts.